Russia has said that it is imperative for Iran to join a peace conference on Syria proposed by The U.S. and Russia. “The issue of Iran (participation) is key for us,” said Sergei Lavrov, Russia's foreign minister, while on a visit to Paris on Tuesday. France has opposed Iran’s participation. Russia has argued that both Iran and Saudi Arabia should take part in the negotiations as part of a new push for peace agreed by Moscow and Washington. On Monday, Lavrov said that he and US Secretary of State John Kerry had agreed in Paris that more “clarity” was needed about who could take part in the proposed negotiations before a date for them could be set. The conference will be held in Geneva. Although there is still no firm agreement on the date, but it could happen on 15-16 June. Slavs have an innate hatred of Wahabbi terrorists who they have fought in Afghanistan and now in the Caucasus. President Assad is a Shia ally leading a secular nation. Russia is simpatico with Iran and there has not been NOT A SINGLE incident of Shia terrorism against Russia or any other nation can be proved,with the exception of Hezbollah and Amal resistance running the Americans out of Lebanon in the 80s. Russians have grown cahones as they know the dreadful consequences of an improbable Salafi cannibal take-over of Syria which will have a domino effect all over the region and in the Caucuses. Russians are quite comfortable with the Iranian position in the region from Afghanistan to Syria and they will stand by Iran as they see a US/Zionist effort to weaken and encircle them. From the days of Peter the Great, Russia is paranoid about Salafi fundamentalism. This a fight for Russian security by proxy. Putin has a strong sense of Russia's destiny as superpower despite the USSR setbacks. Russian Bear is now out of hibernation and will claw its hyena enemies if need be. A giant Russian military transport landed in Latakia Tuesday carrying 60 tons of undisclosed supplies. From satellite images the nature of this cargo is unknown, but it is likely to be S-300 anti-air missiles to its winning ally President Assad “a stabilizing factor” for dissuading “hotheads” from entering the conflict. Russia is also strengthening its military and political cooperation with regional powerhouse Iran. 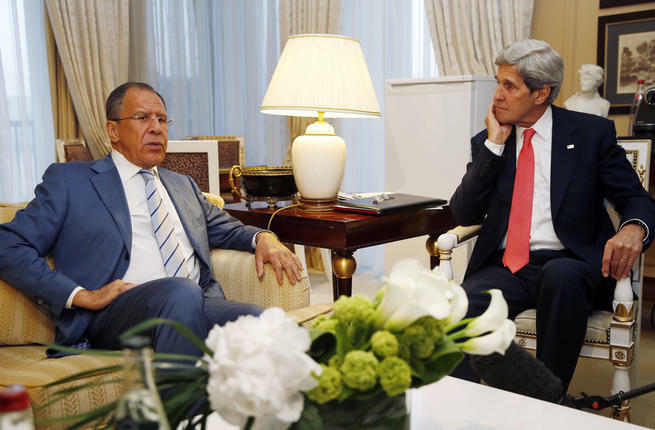 The body language of a sprawling Russian bear is very telling an Kerry gets lectured. Two years later, however, the conflict has only become more bloody and destabilizing as opposition groups fracture and multiply. The United States is providing nonlethal aid directly to the Free Syria Army, Arab countries are arming the rebels and Russia and Iran are continuing to provide advanced weaponry to Assad forces. Still, the United States, Russia and Iran might share an interest in blunting the growing power of jihadist groups in Syria. The notion that Iran could be prevented from influencing the outcome in Syria has always been far-fetched, given its historic ties with the Assad regime going back to the 1980-88 Iran-Iraq war, when Syria was the only major Arab country — and one of the few countries in the world — to back non-Arab Iran. Iran and Syria also collaborated in shaping and supporting the Lebanese Shiite militant group Hezbollah and Syria has served as a conduit for Iranian weapons and money bound for Lebanon. After the death of Assad’s father, Hafez, in 2000, Iran became the dominant partner in the Syria-Iran alliance — a relationship that has become pivotal to the survival of the Syrian regime in the past two years. Iran is bolstering Assad with money, weapons and military and intelligence advisers. Senior Zionist military officers in the face of the widening military intervention in the Syria civil war by Russia, Iran, Hizballah and latterly Iraq too. The scared Zionists normally used to killing unarmed Arab civilians now are beginning to see Iran's rise as the real regional superpower and it has made Syria’s civil war the platform for a Russian contest against the West and a ladder up which Iran and its Hizballah cousins are climbing to top Middle East regional food chain and power spot. Russia, Iran, Hizballah and now Iraqi volunteers are winning the contest by default against an confused US-led West and a hesitant Israel, which is genuinely scared of accidental regional war that could eliminate it. The Zionist Chief of Staff acknowledged on Wednesday, May 29, that Israel’s government and military leaders are at a loss on how to proceed. They have yet to recover from the calamitous miscalculation that stubborn President Bashar Assad’s days were numbered to which they clung delusionally for almost two long years like their out of touch western backers. The most glaring outcome of the Syrian situation is the west's complete misreading of the changing regional dynamics, demographics and Russia's new assertiveness. Moscow’s response was ready in place even before the S-300 delivery was published. In the grades Moscow handed out for foreign interventionists: The US and Zionist regime and their leaders were "hotheads" while Moscow, the calm, rational stabilizer in the region. Russia knows that it can count on Muslim street support in any confrontation with the west along with staunch backing from its Chinese superpower ally. Zionists are boxen in and frustrated by US and EU's lack of action and fear that major strategic and military changes are overtaking them and are entirely to Israel’s detriment as well as eroding its options against a rampant nuclear Iran which enjoys Russia and China's total support. Despite a decade of drawing receding "red lines", the Zionist regime knew all along that the leaders of Iran were not concerned and called their bluff years ago, hence the ever changing forecasts of Iranian "nuclear breakout". A confident Iran with Moscow's backing has brought its military assets up close to Zionist borders on Occupied Golan and also in Syria and Lebanon and openly threatens to use them if Syria faces any further aggression. For its part a war weary US already bankrupted by a decade of lost wars and still embroiled in the Af-pak quagmire does not favor military action in Syria and most polls suggest no public appetite for an endless quagmire which has already ruined the declining US economy and propelled China into the world's only real superpower. when the history of both Hezbollah and Syria are written ,THE name of Iran will be there - inscribed in GOLD!!. Gold is for merchants, historians are looking for truth! The Zionist ministerial committee for determining procedures for the conscription of ultra-religious (haredi) yeshiva seminarists to the armed forces settled a major controversy Wednesday. Defense minister Moshe Ya’alon won a year’s extension from three to four years for the interim period for applying criminal sanctions against haredi youths who fail to report for military duty. The authority to apply those sanctions was vested in the defense minister. Compulsory conscription for that community will be introduced gradually over a five-year period. There is increasing draft dodging amongst the general population and the Israeli military is 30% short of its conscription quota. The problem seems to be particularly acute in European background Ashkenazi Jewish groups. This phenomenon has caused resentment amongst the African Falasha and Middle-Eastern Sephardic Jews who now account of the majority of military manpower and also in fulfilling menial jobs in the depressed economy. Tripoli, Lebanon: As the United Nations human rights body under US and EU pressure voted to condemn Syria's use of foreign fighters in its deadly attacks on the border town of Quasyr, it appeared the regime's forces, backed by up to 2000 elite Hezbollah militia, had seized a key air base in the area and eliminated last rebels pockets at Qusayr. Elite Syrian Republican Guards and Hezbollah fighters rushed to Qusayr to bolster the regime's campaign while government fighter jets and low flying helicopters gunships pounded rebel-held areas in some of the fiercest fighting since the two-year long civil war began, the London-based Syrian Observatory for Human Rights said. Western sources confirmed the Syrian victory and the seizure of the critical Dabaa air base inflicting a major blow for US and NATO supported opposition forces, with Syrian state media claiming that Assad's troops already controlled Quasyr from three sides. After five hours of fierce fighting, Syrian state television announced: “Our troops are now in full control of Dabaa air base”. "There are bodies of Takfiri terrorists littering the ground, hundreds of rebels have been captured and others surrendered. The army is now advancing on the town of Dabaa," a military source told Agence-France Presse. The McClatchy news agency is reporting that both sides of the conflict have confirmed that Syrian government forces have seized most of Qusayr. ‘‘We have suffered heavy losses,’’ said Yazed al Hasan, a spokesman for the rebel Farouq Battalions, which have occupied Qusayr since last year. ‘‘We have cleared 13 of them,’’ he said. The border town of Quasyr is a vital corridor to both the Assad regime (as a key part of the road from Damascus to the Mediterranean Coast) and the rebels (as a strategic supply-line for fighters, weapons, medications and other essentials from Lebanon into the Syrian province of Homs). Up to 20,000 civilians remain trapped inside the town, terrorized by Salafi terrorists for more than 6 months and now huddling in basements for 10 days of intense fighting, local sources say. In this increasingly sectarian battle, there are also reports that Sunni militia from Lebanon have joined the rebel forces in their battle against Assad's fighters, their Shiite Hezbollah backers and Iran's Revolutionary Guards. However, the discipline and professionalism of Hezbollah fighters proved too much to handle and the rag-tag Sunni Salafi groups from mainly Tripoli area were quickly routed by the Syrian and Hezbollah forces flushed with high morale smelling victory. France's Foreign Minister Laurent Fabius said on Wednesday there were 3000 to 4000 highly trained Hezbollah fighters in active combat inside Syria. Hezbollah fields a regular guerrilla force of 80,000 and can call up millions of supporters and reserve fighters in a short time. there's a type of "gold" perfect for BMA. First of EIGHT S-300 batteries deployed north of Damascus and can shoot down targets as far away as Cyprus. Zionist pups not barking anymore. Watch President Assad' interview tomorrow. The man is made of steel. VIVA ASSAD,PUTIN, HEZBOLLAH & IRAN. Western media confirm that the Kremlin has delivered first battery of the dreaded S-300 deal to Syria, estimated at $1 billion. On May 28,large Russian and Ukrainian heavy airlifters landed at Latakia airbase followed by special forces units to help with the modernization of President Assad’s battle tested military with advanced air defense systems and synchronizing them with Iranian equipment. With Iran bankrolling its Shia brothers in Syria, President Assad has spent billions in the past few years to buy the best systems that the Russians can produce — the SA 1, SA-2, SA-6, SA-22, SA-17, SA-24, Pantsir S1, Buk 2 and newest S-300 which are now operational. deter enemies of the Assad regime. The speed of Russian delivery highlights the importance of Syria in Russia's strategic equation in the Middle-East and Muslim world. "Syria has received the first shipment of Russian anti-aircraft S-300 rockets," Lebanese newspaper al-Akhbar newspaper quoted Assad as saying in an interview due to be broadcast later on Thursday. More of the missiles would arrive soon, he was quoted as saying. Russia has said it would deliver the missile system to the Syrian government over Western objections, saying the move would help stabilize the regional balance. “Syria will not let any Israeli aggression go unanswered without retaliation. The retaliation will be the same size as the aggression, and the same type of weapons will be used,” the Syrian foreign minister stated. Officials in Israel, the United States' main ally in the region, say the S-300 could reach deep into the Jewish state and threaten flights over its main commercial airport near Tel Aviv. There is a rhetorical device called "metaphor"! To take a metaphor literally says more about the interpreter than the statement. Kudos to Russia and president al-Assad. it takes many months to set up the S-300 and train crews to operate it. your laughter is a year and more premature. Israel would have little difficulty in bombing the crap Damascus again, should they decide to do so. The Russians are confident they come to the event with the strongest hand. Their delegates will lead a front composed of Iran, Syria and Hizballah, which is not only united but the victorious side in the conflict. In contrast, their American co-sponsors and the backers of Salafi terrorist groups, have not been able to persuade the fractious Syrian opposition or its Persian Gulf patrons, led by Saudi Arabia, to put in an appearance at the conference.